The 9th Circuit Court of Appeals in San Francisco has upheld a U.S. law that makes it illegal for Undocumented Immigrants to own or possess firearms. The case stemmed from the arrest of a man who had crossed into the US illegally in 2005, and later in 2014 was arrested for possession of a handgun. He was sentenced to three years for being in possession of a firearm while in the country illegally. While undocumented immigrants do enjoy some of the rights guaranteed to citizens under the Constitution, rights under the 2nd Amendment are less clear. 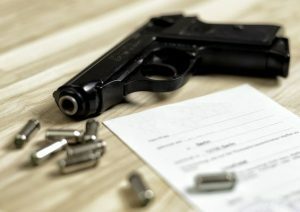 The Second Amendment guarantees “the right of the people to keep and bear arms.” In a landmark decision in 2008, the U.S. Supreme Court said that right applies to individuals. A full copy of the 9th Circuit Court of Appeals opinion can be found HERE. If you have any questions about access to the California Courts, the Federal Courts, or would like information about any of our other products and services, contact us at customerservice@courttrax.com or give us a call: 866-643-7084 (Option 2).